Janome has discontinued several popular sewing machines, knocking them out of the top spot in two categories. We now recommend Brother and Singer sewing machines for beginners and kids. Whether you're a basic sewer, need a fully-featured computerized sewing machine, or want to embroider or quilt, we have a great recommendation for you too. 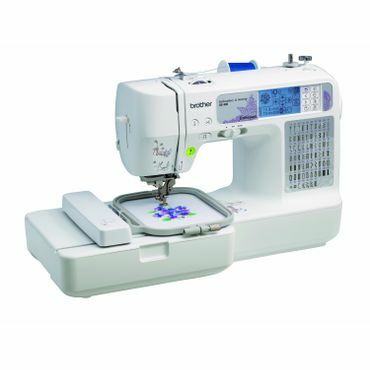 The Brother SE400 gets raves both as a sewing machine and as a super easy-to-use automatic embroidery machine. This computerized sewing machine is considered suitable for new and experienced sewers, and the availability of downloadable designs make it a star, owners say. Some complain about its single, small embroidery hoop, but others say it offers the functionality of machines costing several times more. It works equally well on a wide variety of fabrics, too. Young sewers will appreciate the small footprint and full-sized performance of the Brother XM1010. This is a manual sewing machine (which is preferred for beginners) that is relatively light at less than 11 pounds with a handle for easier portability -- great for toting back and forth to a sewing class. It's sturdy and easy to use, with 10 stitch options. The only real drawback is its feminine, flowery design. 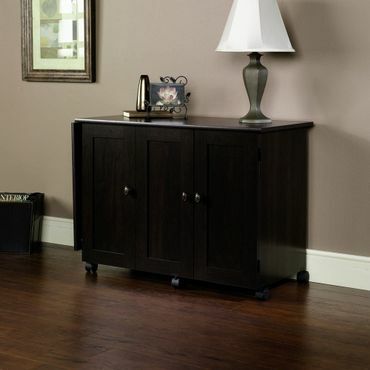 Crafters and sewers love the compact, attractive Sauder Sewing Craft Cart. It folds up easily and the casters roll smoothly. When you're ready to work it folds out to make a large, 63-inch wide work space. It's easy to assemble, they say, and seems to be sturdy, durable and well-built. Many use it as a small desk in addition to a craft or sewing table. It comes in three finishes, Cinnamon Cherry, Amber Pine and Soft White. Unlike some product categories where there may be endless variations and choices, sewing machines fall into two basic categories: computerized and manual (also known as mechanical). Computerized sewing machines are wildly popular, offering nearly infinite stitch and design options for the avid sewer who also wants to do fancy work like monogramming and embroidery. Manual machines, on the other hand, are great if you just want a sturdy machine that's straightforward to use. Most experts say it's easier to learn to sew on a manual machine because of their old-school, turn-the-knob designs, but as we all become more computer literate, that gap is closing. Often described by owners as a "workhorse," the computerized Brother CS6000i (Est. $160) sewing machine is the by far the most popular sewing machine around. It earns 4.5 stars in more than 7,000 user reviews at Amazon and 4.6 stars in more than 2,000 reviews at Walmart. 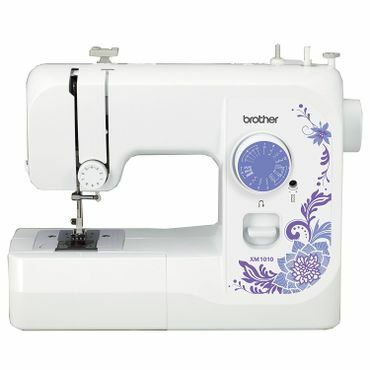 The Brother CS6000i features 60 stitch styles and a one-step buttonholer with seven different buttonhole styles -- including an eyelet and a keyhole shape. Stitch settings are displayed on a small LCD screen, and buttons instead of dials allow you to change stitch type, length and width quickly and easily. Users give the CS6000i particular praise for how simple it is to use in general -- suitable for both beginners and experienced crafters. If you begin a project and set up the machine parts incorrectly, an error message will appear, enabling you to reset before ruining your fabric. Nine presser feet come with the machine and it will tell you which foot you need for each project. One of the most popular of the included presser feet is the walking foot -- which quilters love. The machine also has a wide work surface and an extension table for bigger jobs. A button on the chassis controls the start/stop functions and speed, and we saw several comments from sewing teachers that this is a great machine for using in classes with people who have physical limitations that affect their feet or legs. Of course there are dissenters. In the last update of this report, there were no professional tests of the Brother CS6000i. This year, however, both Wirecutter and Top Ten Reviews included it in their most recent rounds of testing. Wirecutter say the CS600i's "mechanics felt cheap" and that most people won't use that many stitches anyway (although in another report they recommend a Janome with 167 stitches, so there's that. We discuss that machine in greater detail in our section on changes to Janome's sewing machine lineup.). At Top Ten Reviews the CS6000i comes in at number six out of 10, with lower scores for accuracy and ease of use. However, we definitely do not see those complaints reflected in real world use, so are sticking by our recommendation. We sew ourselves, and hang out with a lot of people who sew a little and a lot, and this machine is all most people will ever need. It's a good basic sewing machine, with lots of "fun" stitches that will be there if you ever want to try them -- or if one of your kids or friends wants to try them. While there are a (very) few reports of jams and needle breaks, most users say the Brother CS6000i is a sturdy, durable machine. Among the CS6000i's many included accessories is a hard shell case that makes it easy to transport. However, if you want a truly portable sewing machine, visit our discussion of portable sewing machines elsewhere in this report. If you want even more stitches, Top Ten Reviews recommends the Singer Stylist 7258 (Est. $180), which they name as their top budget pick (the site's top pick seems to have been discontinued). The version of the Stylist they recommend does not come with a case, but the Singer 7258 with Carrying Case (Est. $205) does, although that jacks the price up a bit. In spite Top Ten Reviews recommendation, a close read of their reviews finds little that their testers liked about the Singer Stylist 7258 and it ultimately earns a D+ for sewing accuracy. To be fair, they say that was due to "puckering while using decorative stitches on satin and cotton" and a straight stitch that wasn't perfect. Neither of those issues will bother most basic sewers, and that's who should buy this machine. What Top Ten Reviews does like about the Singer Stylist 7258 is the plethora of features at a low price. That includes 100 preset stitch options, 10 presser feet, an easy, one-step buttonholer, a built in needle threader and an automatic tie-off option. However, unlike the Brother CS6000i, it does not have a table extension. Owners like this machine a lot, giving it 4.4 stars in nearly 2,700 reviews at Amazon, ratings that we see reflected at other retail sites as well. Most say it's particularly good with heavy fabrics, is easy to use, and they love the many stitch options. If you want to do a lot of embroidery, we recommend you take a look at the Brother SE400 (Est. $330). It gets very good reviews as both a sewing machine and an automatic embroidery machine. This model includes 67 stitches and 10 buttonhole styles, but the two features that stand out at this price point are an embroidery hoop and USB input for downloading designs and stitches directly from the Internet. Users rave about the SE400's many features, and about how simple it is to learn and use. They say the LCD screen is easy to navigate, and many report making and/or decorating a range of items including clothing, pillows and blankets. We also saw many comments about how quiet and durable the Brother SE400 is, with a number of reviewers saying they've had it for five years or more; they just get it serviced every few years and it keeps going. The major complaint about this sewing machine is that its 4-by-4-inch embroidery hoop is too small, but keep in mind that embroidery machines with larger hoops and more specialized downloading capabilities can cost more than $2,000. Quilting is a type of sewing that's in its own class; you need a sturdy machine with specialized stitches and accessories. Some sewers can afford to upgrade to the stratospherically expensive longarm quilters (which we don't cover in this report), but for most people, a sewing machine geared toward quilt makers is a better, easier and less pricey option. One great choice in sewing/quilting machines is the manual Juki TL-2000Qi Sewing and Quilting Machine (Est. $650). Juki is a well-respected name in the sewing world, and the Juki TL-2000Qi is a moderately priced, sturdy and durable machine that can handle even heavy-duty projects. An extension table is included that extends the work area to 23 inches -- a nice touch when working on larger projects. However, although we've seen this referred to as a longarm quilter, it is not one; you'll be disappointed if that was what you were expecting. Owners like the Juki TL-2000Qi quite a bit, giving it 4.4 stars in nearly 90 reviews at Amazon, and many of those are from people who consider themselves to be professional sewers. They do caution, though that this machine is NOT for beginners, it's for intermediate to experienced sewers and quilters, so there will be a learning curve if you are a beginner, something we saw reflected in the reviews. We also saw a few complaints about durability issues, but they seemed to come primarily from those who had purchased refurbished machines. All in all, most are pleased, and the Juki TL-2000Qi also gets high praise from the authors of several sewing blogs who review it based upon their experiences with the machine. Because it's aimed at quilters, it has only one stitch, a straight stitch, but its speeds are highly customizable for sewing lighter or heavier fabrics. The manual controls are very easy to adjust, and it has a side-load bobbin with an automatic winder. The two features quilters like best though are the automatic thread trimmer and the fact that when you stop the machine, the needle stops in the down position so you can turn your work without it sliding out of place. The TL-2000Qi includes four presser feet, a darning/free motion foot, a straight stitch foot, a quilting foot and a walking foot. It's quite a bit more expensive than the Juki, but the Baby Lock Aria (Est. $3,500) is the dream machine of many sewers and quilters. 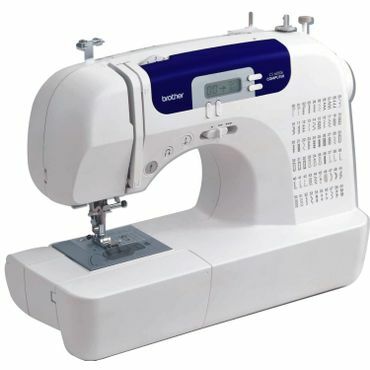 It's a computerized sewing machine that expert reviewers love for its ease of use and excellent stitch quality. The Aria has 573 unique stitches, including embroidery stitches, and is almost fully automatic in all of its many functions. It has an extra-large LCD color touch screen that reviewers say not only makes it easy to select stitches, but also offers step-by-step videos to guide you through any process. The package includes a plethora of handy accessories, and there are even more available as options. Like most very high-end machines, the Aria can only be purchased through an authorized retailer, so user reviews are few and far between. However, Baby Lock is a very well-respected manufacturer of sewing machines, and we read several reviews that say the Aria performs as well as commercial-grade computerized sewing machines costing twice as much. In addition, with its digital dual feed, independent bobbin winder, pivoting feature and large workspace, some reports say that it's a particularly great choice for quilters. One caveat: in spite of its reviews for being easy to use, at least one well-respected expert suggests that this machine is better suited for intermediate to advanced sewers, not for beginners who may be better served by gaining experience first on a more basic machine. If you're thinking about learning to sew, the most important thing you need to know is that a bad sewing machine can lead to more frustration than fulfillment. Poorly made machines usually don't have good tension, which makes threads and stitches bunch, catch and snarl -- which is enough to make anyone quit before they've even finished their first project. Fortunately, we have seen a growing number of reviews that specifically recommend sewing machines that make it easier for beginners and kids to dive in to the craft. One other tip that almost everyone agrees on is that it's best to learn on a manual (mechanized), rather than a computerized machine. They tend to be sturdier, less confusing, and offer a good grounding on the basics of sewing. One that gets a good consensus from experts and owners is the Singer 4423 Heavy Duty (Est. $200). The "heavy duty" designation in the 4423's title is not hype: it's a great choice if you sew a lot of heavy fabrics, like denim or canvas. But it also gets good reviews for lighter fabrics. In testing at Wirecutter, it handled stretch knits better than the top pick there, the Janome Mod-19 (which we discuss in more detail below). The Singer 4423 features 23 stitches and a highly praised, one-step automatic buttonhole feature. In fact, owners and experts say that it's very easy to use in all respects. Wirecutter notes that, "We think a beginner could sit at this machine and start sewing without spending a lot of time with the manual." It also gets kudos for its automatic needle threader and simple-to-use dials. Owners are highly complimentary, giving the Singer 4423 4.3 stars in nearly 3,000 reviews at Amazon. The one consistent complaint we saw was related to tension issues, with thread bunching and jamming -- many reviewers point out that a careful read of the manual can help solve those issues. 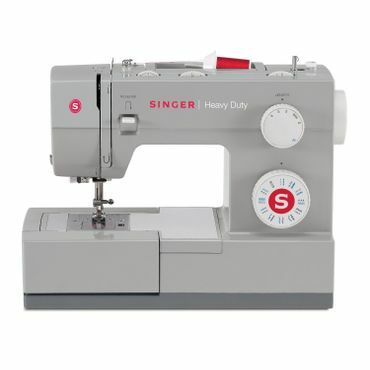 If you'd like to spend a bit less and think a more basic machine will work for you (or you just want to test it out before you commit to finding your inner seamstress, consider the Singer 4411 Heavy Duty (Est. $130) instead. It's the little sister of the 4423 and has a good range of features for a basic sewing machine. Those include 11 built-in stitches, a 4-step buttonholer, a free arm option, three needle positions, and a very good array of included accessories. It also offers onboard storage to keep everything organized. This machine was the former runner up at Wirecutter, and is recommended for beginners in a roundup at Good Housekeeping. Some note that learning to thread the machine and bobbin has a bit of a learning curve, but that it's otherwise easy to use. Owners give the Singer 4411 pretty good ratings, a tick below the 4423's though, with 4.2 stars in nearly 1,600 reviews at Amazon. Other than the treading issue, most of the complaints we did see didn't seem to have a unifying theme: most were fairly random durability issues -- along with some that may have been user error. And some say it's not as "heavy duty" as they would have liked. As anyone who has more than a passing interest in sewing knows, Janome is a very well-respected name in sewing machines. While they do make pricey, high-end machines, they're much beloved for their more moderately-priced, but sturdy and easy-to-use offerings. In our previous report, the Janome Magnolia 7318 (Est. $300) was our Best Reviewed sewing machine for beginners. It's still available in limited quantities online and at Janome retailers, but it's being phased out by Janome. Which is a shame because it was a very well-liked machine, beloved for its very low learning curve coupled with its powerful performance and even, consistent stitches. It's great for crafters because it works particularly well on heavy fabrics and thick layers -- ideal for making items like purses or working with leather. Where the Janome Magnolia 7318 really shines is its intuitive controls. Many first timers say that they were sewing almost immediately after unpacking their Magnolia. Its four-step buttonhole feature, while not as quick and simple as the one-step buttonholer on the Singer 4423, is still said to be very easy to set up and use. The controls are well-marked, so there's very little opportunity for confusion. The bobbin drops in from the top and it includes onboard storage for the included accessories. Its extra-wide work surface features easy-to-see ruler marks. We still recommend the Magnolia, if you can find it, and it'll last forever. The Magnolia was the top pick at Wirecutter in their last report, however, they've recently updated that pick to the Janome Mod-19 (Est. $160). Our feeling is that you can't go wrong with a Janome, but the relative lack of reviews for the Mod-19 -- 4.2 stars in fewer than 25 reviews at Amazon -- is causing us to hold off on giving the Mod-19 a full-throated recommendation. Still, if you want a sturdy, basic mechanical sewing machine, the Janome Mod-19 fits that bill. It's very similar to the Magnolia, with 19 stitches (the Magnolia has 18) and four-step buttonhole feature. It's terrific, reviewers say, for working on all types of fabrics, and feels sturdy and stable, much like a heavy-duty vintage machine. What we really love about the Mod-19 is its design of geometric patterns in gender neutral colors, a welcome change from the girly flowers and pastels that many of the machines in this report (including the Magnolia) feature, and that we would love to see sewing machine manufacturers get away from. In Wirecutter's recommendations for sewing machines for intermediate sewers, they recommend another Janome, the Janome DC5100 (Est. $600), a computerized machine -- although they don't seem to have tested it. They note that it's a "best bet for intermediate sewers and for beginners who know they love sewing and can invest a little more for features that will make learning easier." We agree with that sentiment, but not everyone can afford a $600 sewing machine, no matter how much they love sewing. Those who did spring for the Janome DC5100 seen to like it well enough, but there aren't really a lot of reviews out there and it gets no better ratings than cheaper computerized machines -- 4.4 stars in just over 50 reviews we spotted across a couple of listings. Most say it's a great machine for a variety of projects, even heavier tasks like quilting and upholstery, and that it's super stable and smooth. 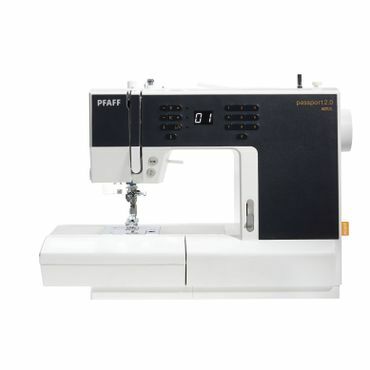 Others say that for the price it's no better than cheaper machines they've owned -- and on at least two occasions we saw it compared unfavorably to our Best Reviewed sewing machine, the much cheaper Brother CS6000i (Est. $160). The Janome DC5100 features 167 stitches that includes the ability to sew alphabet letters. There are five, one-step buttonhole functions. It's white with pink accents, something that one male reviewer who considers himself an expert sewer takes issue with. We've already made our feeling clear on that. Again, boys sew too. And speaking of boys -- and girls -- if your child is seriously interested in learning to sew, it's important to buy a "real" sewing machine. Toy machines don't actually allow kids to make very much, and do little more than snarl thread in uneven stiches. A real sewing machine is also a decent investment. If your child doesn't stick with sewing, you won't lose too much on the resale of the machine. Both the Singer and Janome sewing machines profiled above are extremely well-suited for any beginner age about 10 and up, but for younger kids you might want something more basic, like the Brother XM1010 (Est. $100). Usually on sale for less than $100, this is a machine that would serve any beginner well, not just a kid, but it has a few features that make it particularly kid-friendly. For one, it's nice and light at just under 11 pounds with a carry handle, perfect for taking to a sewing class. The Brother XM1010 is a manual machine -- preferred for beginners and easier for children to master -- with 10 stitches and an easy, four-step buttonhole feature. It's also reported as durable and sturdy. Owners give the Brother XM1010 4.1 stars in nearly 85 reviews, which doesn't seem particularly enthusiastic, but we noticed that many of the complaints seem to center around shipping issues or other things not related to the actual performance of the product. And there are some puzzling 1-star reviews, such as the one left by a customer who said they'd never used it so they don't know if it works. Or the 1-star review where the customer said that they love the machine and that's why they gave it five stars when they clearly did not. In other words, there seem to be more "unclear on the concept" reviews for this product than we normally see in this small of a sample, so we're guessing its overall rating is closer to the 4.5-star mark. Those who actually understand how reviews work say this is a terrific machine for beginning sewers, praising its portability and small footprint. We spotted several comments from parents or grandparents who said they bought the XM1010 as a gift for a child who wanted to learn to sew and they were pleased at how quickly they picked it up. The Brother XM1010 includes a multilingual instructional DVD that users say was helpful both for them and their child. It also has an easy-to-understand owner's manual. What we don't like about the Brother XM1010 is the flowery purple design painted on the chassis. We can't say this enough: boys sew too (full disclosure, I taught both of my boys how to sew and they're better at it than I am). If we could ask one thing of sewing machine manufacturers, it would be to stop with the gender stereotyping on sewing machine designs. Unfortunately, we don't have a runner up in this category. Last year's Best Reviewed sewing machine for kids, the Janome 11706 Hello Kitty Sewing Machine, has been discontinued, which is a shame since it was one of the only really good three-quarter size sewing machines around. As was Janome's also discontinued three-quarter size Janome New Home 720. If you can pick any of these machines up on an auction site for less than $200 new or $100 used, it's probably worth it. In the meantime, hopefully, a comparable product will come along that we can recommend for our next update.